Feelings: RB and I met up with our friends who are going to Japan on their honeymoon! Since they already had experiences with okonomiyaki and other Osaka eats, we decided to head out to Ippudo for a little taste of Japanese ramen. The wait was long, about 20-30 minutes, but we enjoyed our conversations over 2-for-1 Kirin happy hour at their bar. SSam completely impressed me with his order of grilled shishito peppers as appetizer. What a perfect and healthy choice of appetizer! Not many Japanese people would think of ordering these somewhat underrated delicious vegetables. They are bitter and sweet, resembling the flavor of green bell peppers and are good alternatives to edamame. RB and JHays got miso ramen with Berkshire pork chashu. 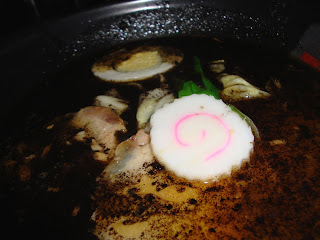 The broth was so dark I could not even photoshop the picture I took. It was almost excessively robust and quite powerful, strangely without flavor of miso. JHays later found out that miso was stuck on the bottom of the bowl. Ah, we were supposed to stir the broth before we started slurping. SSam and I ordered more subtle flavor of choice, shoyu ramen. I am not sure why, but it was not as good as I remembered. Perhaps because the broth was not hot anymore after having to wait for about 10 minutes for miso ramen to arrive. 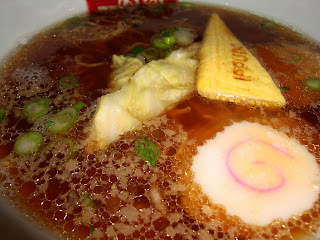 It was also a bit more on salty side, and I expected a little more layered flavor of shoyu broth. 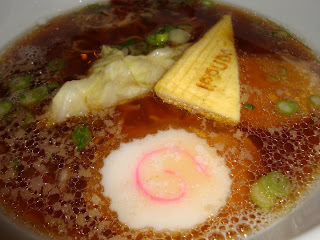 Did ramen blogging make my taste to the higher, ramen snob level, or did they simply go down hill? Nevertheless, I enjoyed my time with our new friends, and I wish them an amazing honeymoon in Japan! 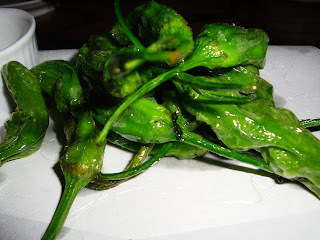 I love the shishito peppers at Ippudo! But tell me, what exactly is that pale powder I've been sprinkling on top of them??? you dip into the powder. it's actually just some seasonings.. nothing weird. every place has its own recipe.